New Ultra-light Laptop features Ultra Low Voltage, Ultra Long Battery Life Intel Core Solo CPU, Intel® Centrino Mobile Technology, 12" WXGA LCD Active Matrix Display, 4-IN-1 Flash Memory Reader, Built-In Fingerprint Reader, Intel® Pro/Wireless Lan and Optional Bluetooth. The SL2 is a remarkable first! CompAmerica has announced its new Snow Leopard (tm) Laptop (or SL2 for short) an ultra-lite, ultra-durable little bundle of mobil computing joy. If mobility, durability and portability were all rolled into one product, the Magnesium Alloy Case design of the SL2 certainly does deliver. "The SL2 is a remarkable first!" The new SL2 Laptop weighs in at a mere 2.8 pounds, including the battery. 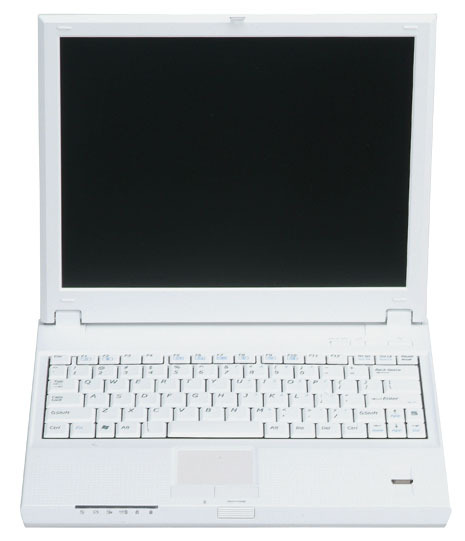 Yet is has a wide 12 inch WXGA screen that's fit to play DVDs, watch TV, browse the Web and everything in between. It can burn CDs and DVDs, and is designed for work or for play. 100% compatible with all Microsoft, Adobe, and other PC products, SL2 breaks new records for the Ultra-Light league, the first ultra-light that does not compromise on features. It includes a 4-in-1 memory card reader, for instance, and even has its own built in Fingerprint Reader. Yet, though it possesses all the features of the largest laptops, the SL2 can practically fit in the palm of your hand, it is all of 11 x 9.3 x 1.2 inch in dimension, scarcely bigger than a pad of paper. Though much lighter than nearly every other laptop in the world, SL2 sports a standard A4 size Winkey Keyboard and touchpad locator and a very vibrant High Definition audio interface. SL2 is being shipped with a choice of Microsoft Windows XP Home or Pro, and is also 100% compatible with Red Hat and other Linux, and a wide variety of software options. With a starting price of only $1399, the SL2 is about 40% less than the price of the nearest small laptop competition. For more information, contact CompAmerica at 908-931-1200.